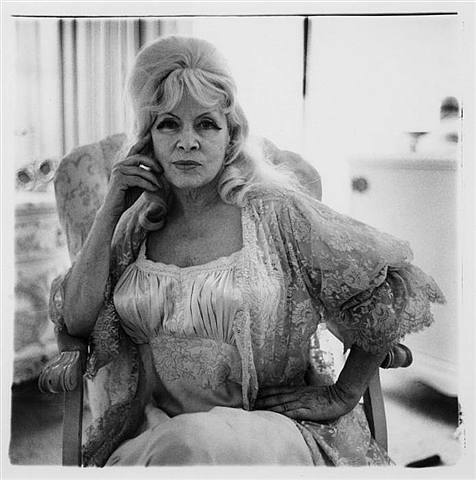 Over the years there have been many rumors about Mae West, but the most bizarre rumour has to be that SHE…was really a HE! Years ago, I read an article about the “real” Mae, who was indeed a woman. It stated that she died in the early-1950’s, yet reports popped up that her brother had died instead. Then, HE took over the whole Mae West persona. At this time, apparently, there was a noticeable switch in Mae’s appearance. Personally, I never found her feminine, but as the story goes, this brother who became his famous sister in order to carry on the legacy had some manly features that couldn’t be disguised, like an Adam’s apple and much larger hands. carefully at photos from around 1950 on it definitely looks like a different person not to mention the big hands and masculine features, bone structure, etc. 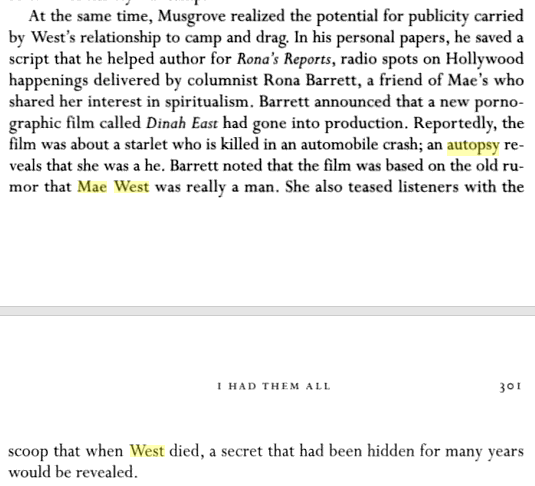 I may not have all the details 100% correct but I would almost put money on the fact that the ‘Mae West’ ‘who died in 1980 had a weenie!! Additionally, Raquel Welch, who worked with Mae West on the film, Myra Breckinridge thought there was something suspect about Mae West too. Yep, Welch also thought she was a man! In fact, she said she looked like “A Dock Worker In Drag!” LOL! Below: A screen grab about Dinah East…and the “secret” to be revealed upon Mae’s death!